This smaller Cherry Blossom Plate is the perfect size to serve a starter salad, dinner roll, or dessert at your next dinner party. The accessible color scheme and pretty design also make it a fantastic plate to use on a daily basis or arrange within a restaurant’s individual setting. With a range of uses, one thing is certain - this Japanese plate is sure to become a favorite piece. Part of the Blooming Blue and White Dinnerware Set, the face of this Blooming Blue and White Cherry Blossom Plate has a sophisticated cherry blossom design. Each blossom is in full bloom, for a whimsical and uplifting impression on your guests. These charming cherry blossoms are the Japanese symbol of a joyous existence, but also reflect the fragility of life. These blue blossoms are set against alternating backdrops of blue and white plaid and a soft blue. This gorgeous Cherry Blossom Plate is glazed in a glossy, eye-catching finish that highlights the details of the plate’s design. Both the smooth glaze and quality ceramic are dishwasher and microwave safe, making this Asian plate incredibly easy to use and clean. 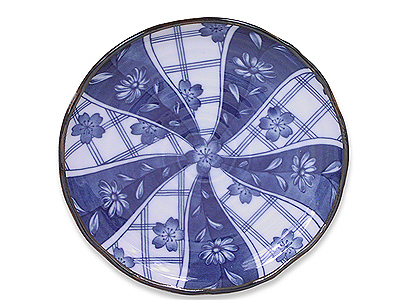 Set your dinner table with this smaller plate and the larger Japanese Dinner Plate for a classic look and feel.